As a person who travels and sketches, something I'm frequently bumping up against is my lack of interest in perspective drawing. I know this is the one big innovation from Western Art, and is the key to convincing realism. These fancy-schmansy images that emulate the behavior of the human eye. But - as we've heard a few weeks ago from Georges Braque, perhaps correctness isn't the only thing that matters? 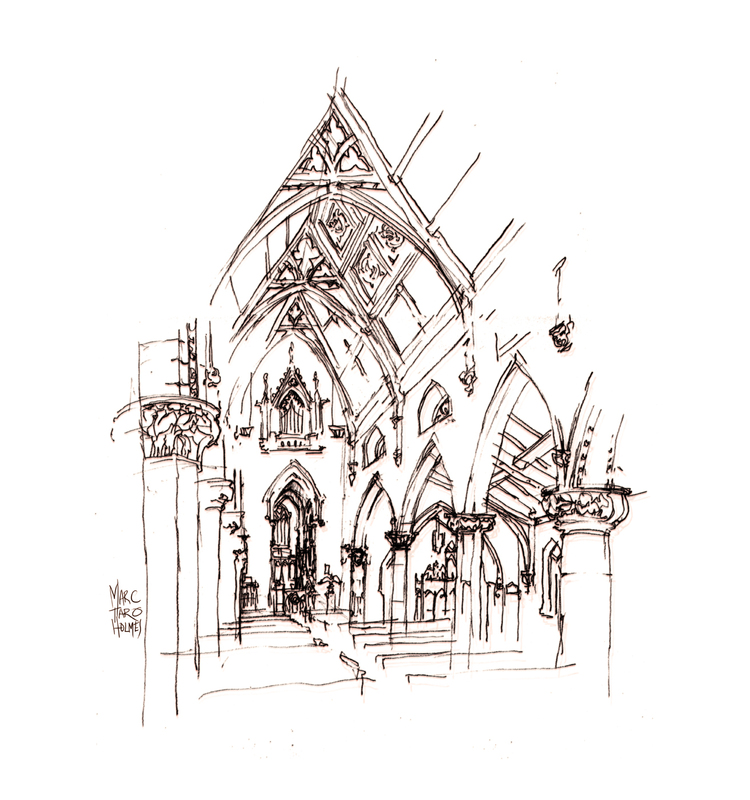 Typically, inside a venerable old church, or a fusty museum, (the kinds of places I find myself drawing interiors), there are amazing things all around you. I just want to get it all in! And as fast as possible! There's an entire castle to draw today! (Or whatever it might be). Proper perspectives can get in the way of a suitable speed of execution. I feel that even an experienced artist needs to take their time planning one of these. Setting up the vanishing points and guidelines. Measuring things to see where they fall in the structure. Learning the underlying grid the architects have built. I would say, most artists that do these well spend at least an hour setting up the drawing. And of course, it shows! They get great results. But it's hard for me to delay gratification like that. Plus, when I have a wealth of detail around me, it's always frustrating to leave anything out. When something is drawn correctly to scale - most of the time that means you can't really see it! Unless, like many draftsmen, you're making huge drawings. In a sketcbook sized perspective, once you're past the second pillar in the row - I bet you can't really see the carving any more. Not to mention, if your viewpoint is fixed, that fancy carved candlestick that you're dying to draw? It might be just outside a doorway, only a few degrees beyond reach. Wouldn't it be great if you could somehow see around corners? So here's a few things I find myself doing, right or wrong, to make sketches that are high on 'sense of place', if a bit low on realism. I have this principle I call 'Roof Line/ Ground Line' - which I talk about in the Painless Perspective chapter of my online drawing class. (Or you can read about it in this post). Essentially, the idea is to sketch the 'mountain range' of a building or block, and then the grounding line, where everything touches the earth. See those two lines above ? The Roof Line and the Ground Line. I sketch those first, and then everything falls in place. So how does that help us when we're drawing an architectural interior? We can apply the basic principles, but instead of a roof/ground, we have a ceiling/floor line. You know you're inside of a box, so you can count on this X shape to be your guide. Ok, yes the X is a bit of an odd shaped X. It's cut off because the vanishing point is way back there somewhere. You might start by actually sketching the generic X shape, or just by visualizing it. (Or do a Dot Plot). Then proceed to hang the drawing of the room from that ceiling/floor framework. This is a small room. A study/library in the Chateau Dufresne in Montreal. It has these great built-in bookshelves framing the room. I mostly wanted to capture all that gothic looking carved woodwork, but also touch on the ornamental clutter on the shelves and desk. And not miss those iron dragons in the fireplace. Here's another example - this one gets tricky. This is a long corridor inside the Victorian style Redpath Museum on McGill Campus. Now, what I will often do, in a situation like this, is cheat a bit. This long hallway was of course much narrower than the study from the Dufresne above. But I wanted to get the various skeletons hanging on the walls, and some of the display cases - so what I did is widen out the view - spreading out the wings of the X - so that I'm looking at both walls more flat-on than in reality. I stand with my back to the right hand wall, to draw the left side with the turtle skeletons - then put my back to the left hand wall, to draw the right side with the office door. So I'm getting a wider viewing angle than is available from one point perspective. Plus, I'm compressing the distance down the hall - leaving out a lot of hallway between myself and the front entrance. 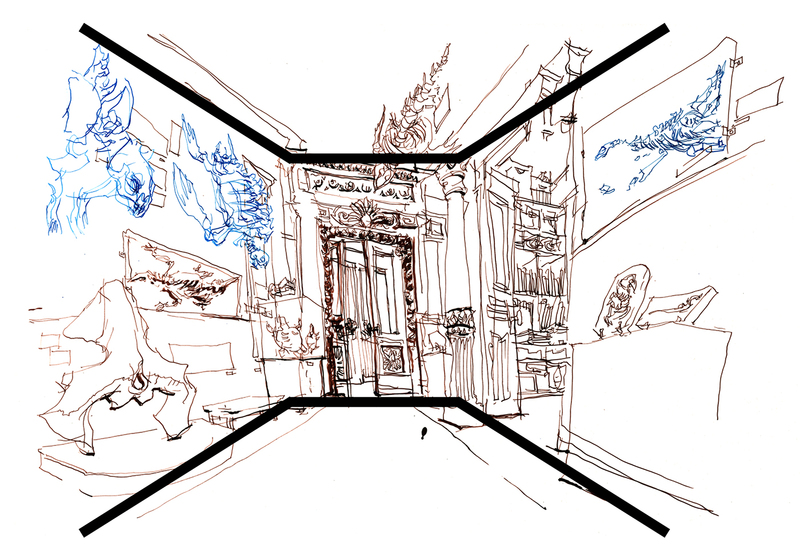 I've skipped some closed doors, flattened a foyer kind of space out of existence - a lot of renovations to reality - in order fit what I want to see large enough in the drawing. I started the drawing from the very back of the hallway, because of the skeletons, but moved to around the middle point so that I could see into the office door. There was a lot of clutter and dusty old academic papers that I wanted to sketch. This museum always gives me a Professor Indiana Jones vibe. There's no way to actually see into that door from down the hallway - so I had to edge forward to get it in. Whatever! It works for what I want to show. Take that, Rules of Perspective! Ok, third example on an interior - this one even more un-likely. What I wanted most out of this little stairwell landing in the Chateau Dufresne was the statue of the frolicking couple combined with the pillars and stairwell - but at the same time I was interested in the yoke-arched doorways and ankh shaped windows that are quite distinctive of the house. And I was able to get in some candlesticks while I was at it. So, to get this ultra wide view in, once again, I've moved from one side of the hall to the other - sort of drawing cross-eyed. In one half the drawing I can see into the next room, and in the other half I can't! Perspective is shattered! But still - it's a fun little drawing with a unique point of view. 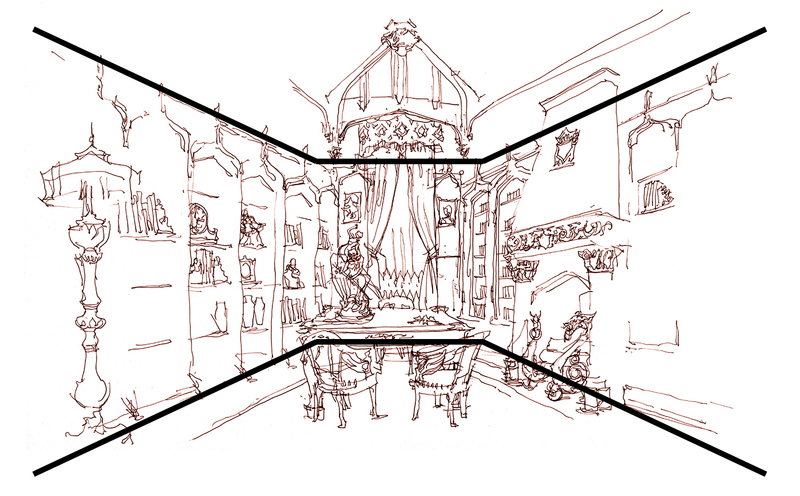 Finally, lets forgo perspective drawing entirely! 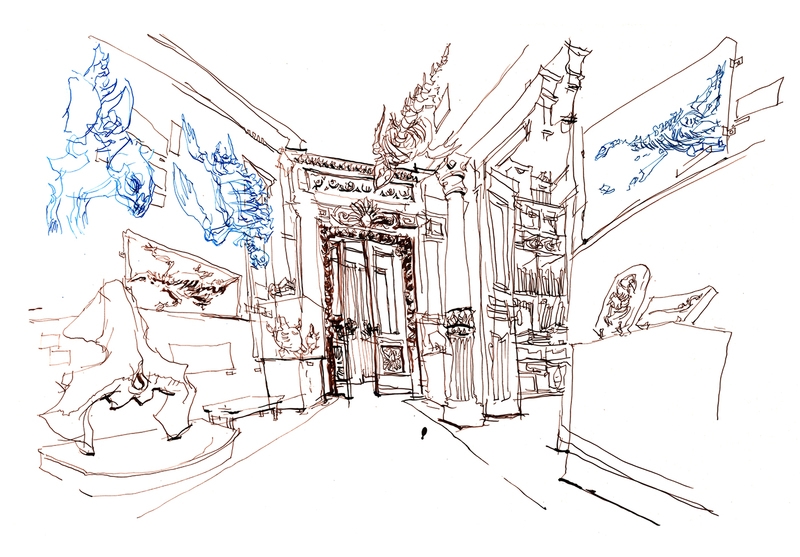 In this sketch, I started at the fireplace on the far side of the room - and just kept on drawing around the room in a kind of continuous panoramic drawing. Imagine you are standing in the center of the room, and just pivoting. Just drawing each important landmark on the walls as you come to it. 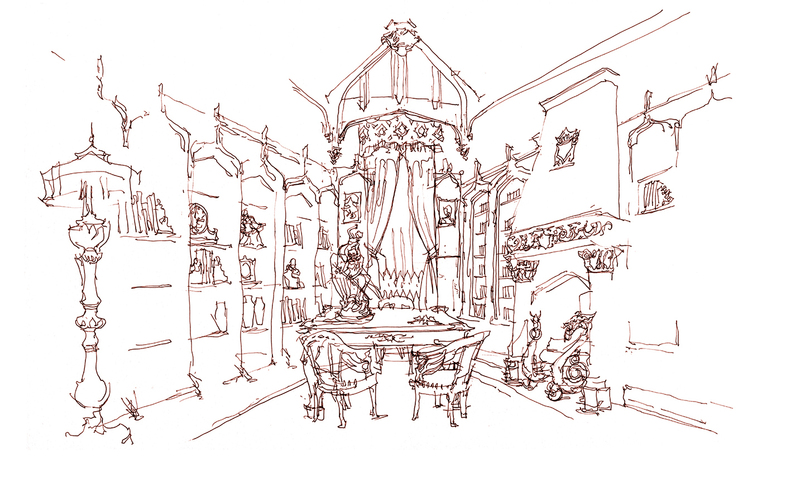 I sketched each of exits to the room, and kind of back-filled the furnishings and connected the paneled walls in between. You might want to try this with an accordion book, so you won't run out of space. Or, you can do as I did and just draw over the edge of the page, onto a new sheet, adding sheets as required. 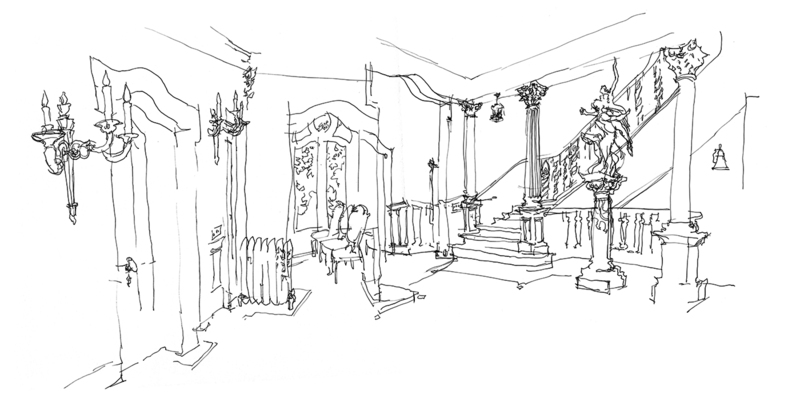 As I drew left to right, going from the fireplace, across each of the three entrances, I was shifting my viewpoint slightly so I could get a good sight-line into the rooms beyond. Similar to what I had attemted in the stairwell. I've decided to call these kind of sketches Panopticons. For the ancient Greeks, a Panopticon was a particular type of building, usually a prison or a library, in which every room could be seen from the a central point. I guess their enemies and their books were the two things they most wanted to keep an eye on. Makes sense to me! I had a great deal of fun with this one. Just drawing, and making it up as I went along. 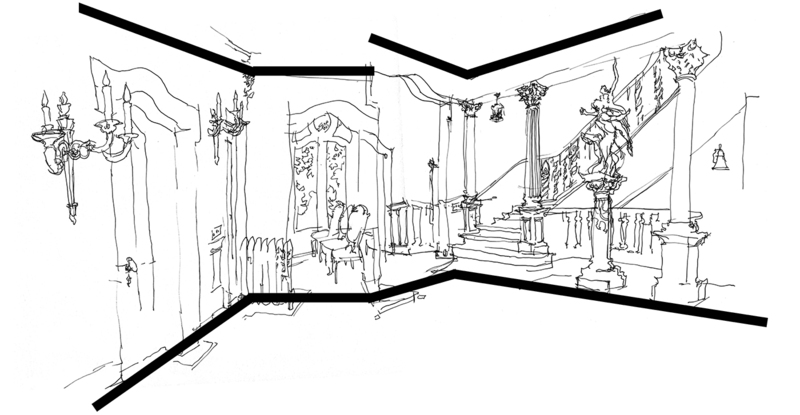 I plan to see what else I can do with these kind of interior panoramic sketches - and I'd be interested to hear if anyone else is playing around with similar ideas. Why not drop me a note or a comment!